Mobile Applications are undeniably one of the greatest inventions of all time. Yes, we might lessen our interaction with other human beings but they make our lives easier. We can virtually download an App for almost everything today. Of course, when it comes to innovations, the crypto-trading world is always in front of the pack; that’s why a lot of respected trading websites have one way or another catered the use of their services through mobile devices. What’s more convenient than having access to your favorite trading platform which just a touch on the screen? Today, we will be looking into three websites that have been providing awesome web-based trading platforms for years! We will be comparing what their website has and the difference from using their new Apps against what we are accustomed to using. Without further delay, let’s talk about that! 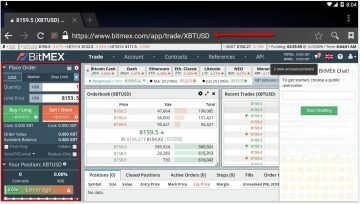 Bitmex.com is one of the most popular trading websites today due to the volume of daily transactions that happen within their walls. The website is backed by HDR Trading Limited and was founded in 2014. Their company is based in Hong Kong and caters to the international market and offers up to 1:100 leverage for Bitcoin. 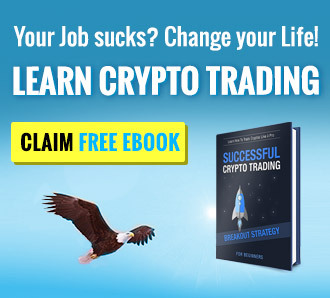 If you are familiar with the BTC trading scene, then this website is not a stranger to you and chances are that you might have an account with them. 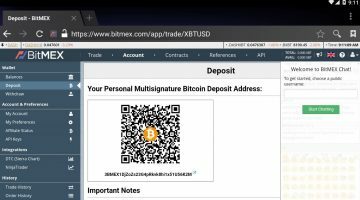 What’s special about Bitmex.com is that they do not have a specific App that you can download through your mobile Android or iOS devices but instead they have a website that can be used in both your computer and mobile device. Before moving forward we would like to address a fake App that can be downloaded from any Android devices (we checked our iOS device and could not find the App available). 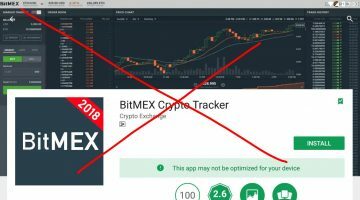 What’s really interesting is that we’ve looked into the app description and it says that the “BitMEX Crypto Tracker” includes status on all coins available on BitMEX Exchange? What does that even mean? We dug a lot deeper and found out that the app is being offered by “Crypto Exchange” and the negative comment saying “Fake app don’t use it” helped in figuring things out. When it comes to downloading new Apps, especially trading platforms, make sure that you are going to the website and if not, make sure that you have the legit one installed. The last thing that you want to do is to give away personal account information to a third party program that will definitely take the information to hack into your account! Mobile Friendly – Unlike the websites that we will be talking about today, BitMEX does not currently have an official App that you will be able to download. But their website is mobile friendly making it possible for you to operate their platform using the browser from your mobile device. The difference between a mobile-friendly website from a regular one is that it would simply not fit! To access the mobile version of the website type in www.bitmex.com/app on your mobile device’s web browser. User Interface – There is no difference between a computer browser and mobile browser version of the platform, making it easy for account holders to move around and go about their business. As mentioned, the platform is beautifully fitted for mobile usage making it easy to operate for people that are already familiar with the website. The order slip can still be found on the left-hand side of the mobile version and the charts in the middle. Functionability – The mobile version works exactly like the website. You also do not need a separate account if you plan to log into your mobile device. Which is better? – Since both of the platforms work exactly the same; it all comes down to how you trade. If you are a person that loves to sit in the comfort of your home then the PC version should be the one to use. If you want to keep everything mobile, then you can log into your account using your device. Loading Power – We were expecting the mobile version to load slower than the regular browser but to our surprise, it loaded quickly! No problems with loading when it comes to the mobile version. Features – It’s not just the interface or which is better, the features are all the same. You can still adjust your leverage, place limit/market/stop limit orders, check your account information, and deposit/withdraw with the mobile version. Currently, BitMEX.com does not have a mobile App for their platform but the mobile version is working pretty fine. They have optimized their website to work properly and efficiently no matter what medium you are using to log into your account. 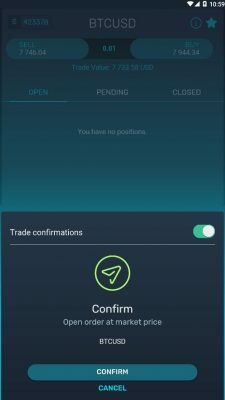 If you have an account with them and decided to place positions while on the go then try their mobile version! eToro.com as you already know is a trading platform that offers Crypto, ETFs, Stocks, Indices, Commodities, and Fiat. The website was founded way back in 2006 and is regulated by CySec. What’s interesting about the website is that users are not only able to use their trading services; they are also able to “Copy People” and increase your trading power. What’s even better is that the website offers an Android and iOS mobile version of their website which we will be looking into today. 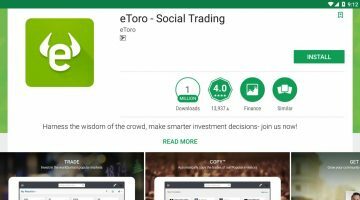 All you need to do is search “eToro” on your Google Playstore for Android and App Store for iOS users. The mobile version of eToro.com has more than a million downloads and is rated 4+ for both Android and iOS devices. The App is approximately 60MB in size and the iOS version requires you to have iOS 9.0 or later. Our Android device is running the latest OS which means we are unable to determine which version it runs on Android and the store is not saying anything about the compatibility, unlike Apple. The latest update for the Android version was just last March 21, 20018 and February 27th for the iOS version. In addition, the App is official and you will be able to read more about it here. Before you download the app into your mobile device make sure that you read through the items that the App will request access to. Please be advised that the App will need access to your device and app history, your identity, photos/files, your camera, and device ID and call information. If you think this is too much then we advise you to rethink your options first before moving forward. Mobile Experience – The download was quite quick due to the size of the file and we didn’t have any problems installing it. Just as expected, their mobile App is a compact version of their official website. Everything is where it is supposed to be and no registration is needed for registered account holders. The main left-hand side contains all the working tabs like Watchlist, Portfolio, News Fees, Trade Markets, Copy People, Invite Friends, Withdraw Funds, and everything. 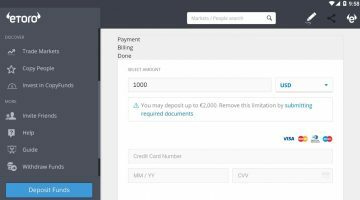 User Interface – The mobile version of eToro’s trading platform is very easy to use and is basically a compact version of their web browser as mentioned earlier. You will find it really easy use since everything is where it is supposed to be. Functionability – Basically, people would use an App version of a web browser platform if they want to trade on the go. 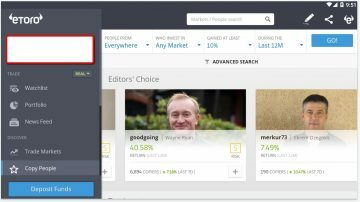 What eToro did is that they migrated every feature that people are used to with their browser version and made it into an Application which you will be able to install on your mobile device. Which is better? – Both web browser and Application works completely the same. Loading Power – The web browser version loads faster but is not that different from the mobile version. Connectivity would determine the loading power for the App version. Since your device is using WiFi, the loading is a tad slower than your browser that uses the internet a physical wire to connect to the internet. Aside from that, the difference can hardly be noticed. Features – Every feature available on the web browser version can be enjoyed in the App as well. Since the Beta version, the App has gone a lot of changes and is currently running version 85.0.0. The App that you will be downloading today is maximized to the point that there are virtually no differences between different platforms making it a very good option for people that want to have “pocket access” to eToro whenever or wherever they want. Operating since 2014, SimpleFX.com is a website that offers Forex and CFD trading. Their base of operations is located in St. Vincent and the Grenadines and has more than 100k registered traders from over 160 countries. The platform also accepts a good amount of deposit options you can choose from making it a flexible trading website. Today, we will be looking into their mobile version and see if there’s any difference between the two and give you guys a good idea of what to expect from their mobile platform. We were unable to locate the App using our iOS device but were able to find their Android version as you guys can see on the screenshot provided above. The App has more than 10,000 downloads and the size of the file is only 6.93MB with the most recent update last March 20th, 2018. Before downloading the App, make sure that you guys confirm that the app would need access to your identity and files associated with the device that you’re using. Once you have reviewed everything click download and this will not take that long to finish. Currently, the App version is still in Beta meaning that there will be tweaking and optimization that’s going to happen within the next few months to provide a much better experience. Right off the bat, their mobile version is completely different from their browser version. Not that it lacks the features that we’re used to but they are arranged differently. One thing that is worth knowing is that their mobile version does not run under landscape mode and only works under portrait. User Interface – Compared to their web browser version, it is really hard to navigate through their App since it is new to us. But with a little bit of practice, we should be able to move around without any issues. Functionability – The mobile version is not a compact version of their web trader but a different entity itself; which easily calls for dedication in going through the App and knowing which is which. You do not need to create a different account and the standing one works just fine. Which is better? – Definitely, at this moment in time, we would go for their web browser since it has been working since 2014 and their mobile app is still at beta stage. Loading Power – The App lags! This is experienced when logging into your account and moving the different buttons within the Application. Features – The browser version of SimpleFX’s platform is much informative and has a lot of tiny features that add up together to be better. One thing to notice is that the app version does not have the tip box that helps us estimate you’re earning per trade. The mobile version has over sixty currency pairs, sixteen crypto pairs, Indices, Equities, and Commodities. Just like the web version, the app also accepts BTC, LTC, ETH, DASH, and BCH for crypto and USD, EUR, GBP and many more for Fiat deposits. Leverage trading of up to 1:500 is also available under their mobile version. The reason why we’ve included SimpleFX’s mobile version on our list is due to their undeniable presence in the online trading world. Their App might be under Beta version but it’s moving in the right direction to become one of the best mobile trading platforms in the future. Since the App is currently still in Beta, all bugs and issues can be reported for awesome rewards.